"Obviously, we'd like to be through the process. That's not likely to happen. But we could perhaps be out of committee...We will go to Copenhagen with whatever we have. Barring another passing shower this evening, the 0.08" of rain this afternoon brings the official September total for Washington, DC at National Airport to a nearly normal 3.31", about 13% below average. Rainfall has not been evenly distributed across the area, however. Washington Dulles is closing out the month with less than 50% of the average amount. In general, precipitation was considerably higher to the east and considerably lower to the west across the Maryland/DC/Virginia region. 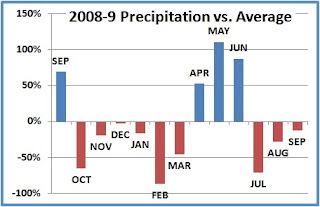 This is the third consecutive month of below-average precipitation, but September is the closest month to average for 2009 so far. A majority of the months (5) this year have been at least 50% above or below average, and going back to May 2008's whopping excess of 179% above average, 10 of the last 17 months have departed at least plus or minus 50% from the average. Only 3 months this year (April through June) have been above average, but they were very wet; each of them was over 50% above average. 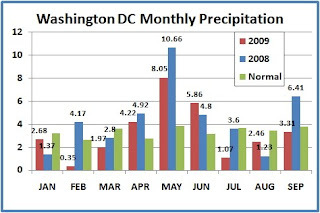 The cumulative yearly total is 10" below 2008's soggy pace, but it's a mere 0.08" below the average through September. Although the statistics might indicate an average year so far, the route to get there was very uneven.